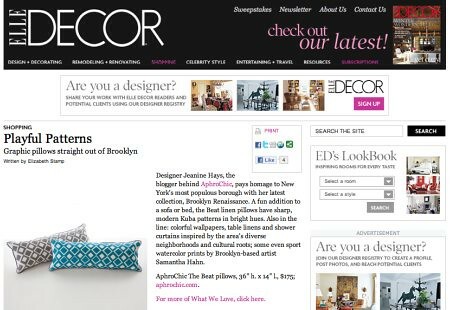 I am so excited to tell you that you can see AphroChic pillows on the front page of ElleDecor.com under the What We Love section of the website! Our newly released Beat pillows take center stage on the site. And you can also find our brand new Vibe pillows for 2011 over at AphroChic.com. If you live in the Bay Area, you can find these newly released pillows at Lotus Bleu in San Francisco. https://www.aphrochic.com/wp-content/uploads/2017/02/Aphrochic-logo-glow-700.png 0 0 Jeanine Hays https://www.aphrochic.com/wp-content/uploads/2017/02/Aphrochic-logo-glow-700.png Jeanine Hays2011-01-04 15:01:002011-01-04 15:01:00AphroChic Featured On Elle Decor!